The Ganesh Chaturthi festival is on these days and Mumbai's favourite son, Ganpati the elephant god, has come to town. This year I remembered my late father in law on Ganesh Chaturthi. He used to love Ganpati and had a collection of Ganpati idols. Buying gifts for him when we went on holidays was easy. Either a very strong perfume or a Ganpati idol would do. He would break into a smile whenever I got a Ganpati for him including once when I got him a dhuti panjabi clad Gonsha, as Ganpati is fondly called there, from Kolkata. Daddy also loved dosas and koolfis and ice creams. When we went to Parsi weddings my mom in law and K would give him their shares of koolfis! The previous evening we had gone for a darshan of Ganpati at Manoj and Anu's though I must admit that I was tempted by the promise of kulchas at their place. Manoj had got a kulcha maker from Chembur to set up a counter outside his apartment just as the Manju guys did the next day. We had paneer and alu kulchas which reminded me of my trips to Amritsar. They were quite like the original ones from Amritsar and warmed the cockles of your soul. We had a really nice time at Manoj and Anu's last evening too and gave aarti after eating the kulchas. K and I spontaneously joined in and did an aarti together for the first time in our lives. Watching Hindi films where aarti is done helped me. A funny thing happened when I entered to Manoj's house last evening. 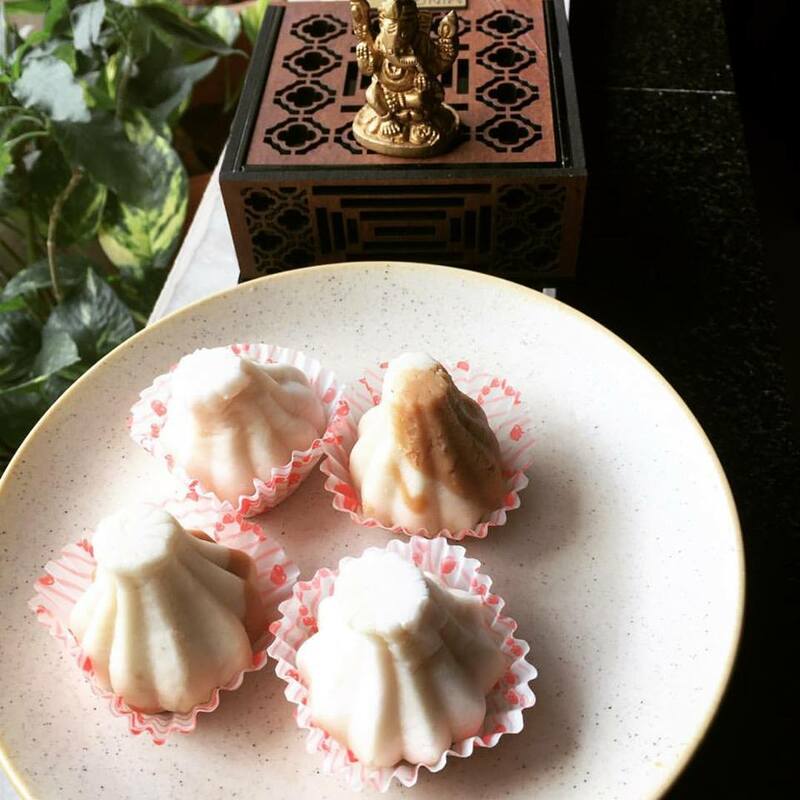 I had taken steamed ukidiche modak, from Ameya, which Ganpati is supposed to be fond of in Mumbai. I placed the box in front of the idol and the box popped open. It was almost as if Ganpati couldn't wait to eat his favourite modaks. I was at Aaswad a couple of days back shooting for The Finely Chopped on YouTube (Pl subscribe to the channel). They had closed the shop to make modaks and were making about 3500 modaks in a day. The video should be up next Thursday. Which reminded me of something Shakti Salgaonkar (An Aswad modak fan) had said on the last Adda With Kalyan - 'what does Ganpati love to eat '- where we discussed Ganpati food traditions. She said that Ganpati is the god of food and foodies and loves to eat! A bit like in Kolkata where Gonesh, thanks to his pot belly, is a name given to chubby kids. My two outings at Manoj and Anu's got me thinking about the connection between food and Ganpati. Like every year, this year too I get texts from folks such as Ashish Karnad, Rahul Velkar, Prasun Acharya and Sandeep Arora inviting me for Ganpati puja at their places. I couldn't make it unfortunately because of work and the distances involved unlike Manoj's place which is next door to us. Each of the invites warmly called us to join them for a meal too. It is almost as if food and Ganpati festivities are intertwined. Today, the panditji, or priest, at Manoj's house gave an extempore speech on how we can adopt the values of Ganpati in our daily life. I asked him, how could I do so as a food blogger/ writer. "Main khane ke bare mein likhta hoon". 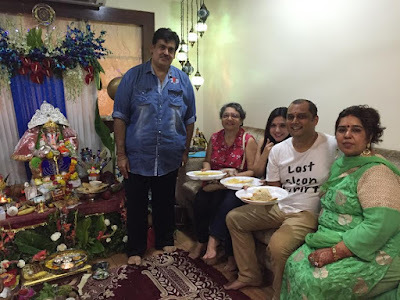 Panditji replied, Ganpati has the head of an elephant but the tummy of a human. So don't eat like an elephant. Realise your limits. When you have a roti, chew it for a long time. That would you won't eat ten. Wise words. I must focus on portion control! Ganpati loves food and is also the God of knowledge. That sort of makes him the God of food bloggers, doesn't it? Today's Ganpati lunch made me a bit philosophical. It struck me that we were a group of Bengalis and Parsis, Buddhists and Zoroastrians, who had gone to visit a Punjabi family, celebrating a Maharashtrian Hindu festival in mumbai, over some South Indian dosas. This to me encapsulates the peaceful, welcoming and inclusive spirit of Mumbai that I so love. PS: I got the numbers of the caterers from Manoj in case you want to try them out for parties. Really good stuff.